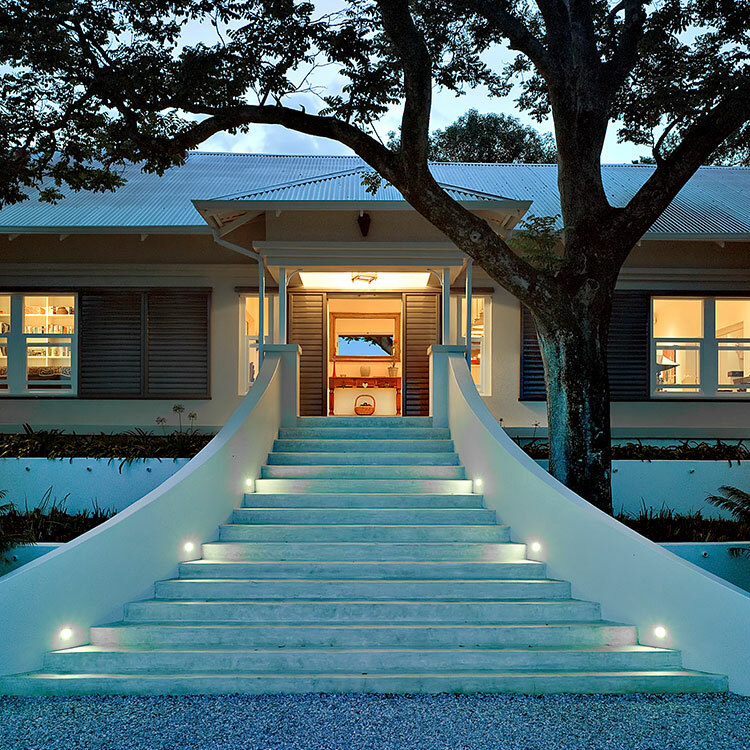 umSisi House was named after the Lucky Bean Tree whose siSwati name is umSisi. This magical tree is indigenous to the area. Our trademark logo is a stylised interpretation of the distinctive flowers that bloom in early spring. In honour of this magnificent tree, we are planting an avenue of umSisi leading to the house as part of our indigenous forest project. We were so amazed about the quantity of information available on umSisi that we thought we should document it for anyone who may be interested! Lucky Bean Trees are small to medium sized deciduous trees with low down branches and a spreading crown of trifoliate, heart-shaped leaflets. They usually grow up to 10m in height, occasionally reaching 12m. The bark is light-grey brown in colour (sometimes ranging from dark grey to grey-brown) and smooth although younger branches will have a scattering of dark, slightly hooked thorns. The wood is light and cork-like when dry and has been used for making canoes and troughs, rafts and floats for fishing nets as well as for troughs and brake-blocks. It can also be used to make shingles for roofing as the wood is durable when tarred. It blooms in the early spring (from August to September) producing its spectacular canopy of bright scarlet, red hot poker-like flowers before its new leaves or just as they begin to show. These clusters of cylindrical, compact flower heads standing proud from their stalks are a distinctive feature of the African landscape in late winter. The pods, filled with 'lucky beans', emerge between November and March after flowering ceases. When mature they appear as twisted black cylindrical pods, tightly waisted between the seeds, and usually hang in clusters. On drying, the pods burst to scatter 'Lucky Beans' which are shiny orange to coral-red seeds with a black patch. Lucky Bean Trees were planted as living fences around kraals, homesteads and waterholes, and were one of the first wild trees to be planted in gardens in South Africa. But it is not just a useful tree; it is also an important component of the ecosystem, providing food and shelter for a variety of birds, animals and insects. Many nectar-feeding birds (sunbirds, orioles, louries) and insects (particularly honey bees) feed on the abundant nectar produced by the flowers. Vervet monkeys and baboons often help themselves as well! Vervet monkeys also eat the flower buds. Kudu, nyala, klipspringer, black rhino and baboons graze on the leaves for sustenance. Black rhinos, elephants and baboons eat the bark. Bush pigs eat the roots, and the brown-headed parrot eats and disperses the unripe seed. Insect-feeding birds happily feast on the thirsty insects that come to visit. Birds such as barbets and woodpeckers nest in the trunks of dead trees and in the soft wood, swarms of bees often inhabit hollow trunks, and the larvae of the Giant charaxes butterfly feed on the leaves. Lucky Bean Trees grow in scrub forest, wooded kloofs, dry woodland, dry savannah, koppie slopes and coastal dune bush and also in high rainfall areas. It occurs in a wide range of altitudes and habitats from North West Province, Limpopo, Gauteng, Mpumalanga, through to Swaziland and Kwa-Zulu Natal. Small pockets also occur further north in Zimbabwe, Botswana and Angola. Erythrina is such an extraordinary genus of flowering tree that four international conferences were devoted to studying it during the 1970's and 1980's. These were attended by some of the world's leading botanists and topics such as the pollination of the tree, its remarkable geography and dispersal and exactly how it should be classified were discussed. 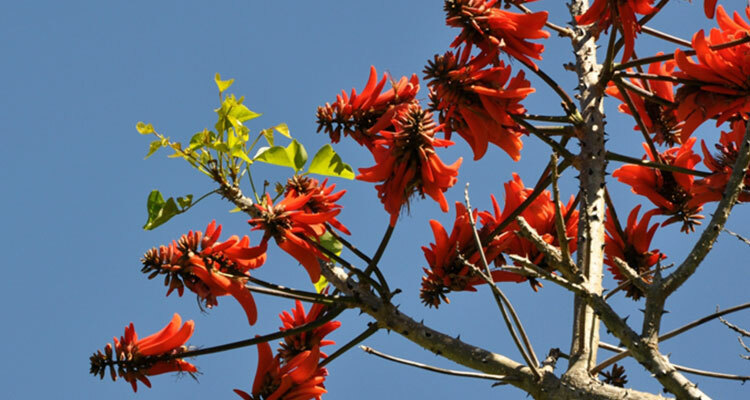 Nine species of Erythrina occur in southern Africa and their flowers are commonly pollinated by passerines (birds with feet especially designed for perching on tree branches!) such as the brown-headed parrot. This method of pollination is apparently characteristic of the 'Old World' species of Erythrina found here. The genus name Erythrina comes from the Greek 'erythros' meaning red (both the flowers and seeds are bright red) while the species name lysistemon (also Greek) means 'with a loose or free stamen'. Lucky Bean Trees are widely used in traditional African culture and many people believe they have both medicinal and magical properties. Regarded as sacred trees they are planted on the graves of tribal chiefs who, while still alive, will also wash in water in which the bark has been soaked as they believe that this will ensure the respect of their people. The flowering of the trees has been, and still is, a good signal to people that it is time to plant their crops. As the name would suggest, Africans carry Lucky Beans for luck! It really is no wonder that this magical tree has been used as a topic in fairy tales since the days of the Brothers Grimm!! The bark is laid on raw to treat arthritis and rheumatism, boiled to ease toothache, and burnt to heal open wounds. Crushed leaves are applied to festering sores, whilst an infusion of the leaves used as eardrops relieves earache. Women about to give birth are given an infusion of herbs wrapped in slivers of bark taken from all the four sides of the tree to make the birth easier. Water in which bark has been soaked is mixed with the root of the Cabbage Tree and used as a purifying emetic. An infusion of leaves relieves toothache. Crushed leaves placed on a maggot-infested wound are said to clear the maggots, and counteract inflammation. The bark applied as a poultice is used to treat swelling, sores, wounds, abscesses and arthritis. Decoctions of the roots are applied to sprains. The seeds contain a large number of alkaloids that are known to be highly toxic, but its use in traditional medicine suggests that they have antibacterial, anti-inflammatory and analgesic effects. Several Erythrina alkaloids, such as erysotrine, are known to have curare-like neuromuscular blocking effects. The general term curare is used for substances that have a paralysing effect on skeletal muscles but are generally not toxic when ingested. In fact, the seed coat needs to be damaged and your mouth full or sores and cuts to have any chance of ingesting a lethal dose. Some specialists claim that the seeds contain anti blood-clotting substances that may be of value in the treatment of thromboses. It has also been rumoured that they are even being studied as a potential cancer treatment.